Plantar fasciitis is the most common cause of chronic heel pain in adults, making up 11–15% of the foot symptoms requiring professional care among adults, according to studies published in the Journal of Research in Medical Sciences. It is estimated that 1 in 10 people will develop PF during their lifetime. A leading biopharmaceutical company developing and marketing regenerative and therapeutic biologics utilizing human placental tissue allografts with patent-protected processes for multiple sectors of healthcare, has announced the first patients have been randomized and enrolled in the pivotal Phase 3 Investigational New Drug (IND) clinical trial to assess the safety and efficacy of AmnioFix® Injectable in patients with recalcitrant plantar fasciitis pain. Top-line results from this study are expected in the second half of 2019. Following the conclusion of this trial, MiMedx intends to file a Biologic License Application (BLA) with the U.S. Food and Drug Administration for AmnioFix® Injectable to treat moderate to severe plantar fasciitis pain that has failed conservative treatment for at least 30 days. The Company projects the filing of the BLA related to plantar fasciitis will be in 2020. Plantar Fasciitis is one of the most common orthopedic com­plaints relating to the foot, affecting approximately 9% of the U.S. population with approximately one million people per year seeking medical treatment. The Company believes 60% of these patients could be potential candidates to receive an AmnioFix injection, which MiMedx estimates represents approximately a $450 million annual market opportunity for the Company. This Phase 3, prospective, double-blinded, randomized controlled trial will enroll approximately 164 patients at 15 centers. Patients will be randomized 1:1 into two treatment groups; a single injection of saline (placebo control) or a single injection of 40mg of AmnioFix Injectable. The primary efficacy endpoint is the change in Visual Analog Scale (VAS) score between baseline and day 90, expressed as the difference in means between the two groups. The primary safety endpoint is the incidence of adverse events, serious adverse events, and unanticipated adverse events during the first 180 days post-injection in the AmnioFix Injectable group versus the placebo-controlled group. 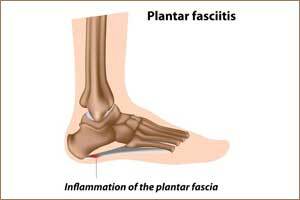 Plantar fascitits can be successfully treated with proper physiotherapy which includes realignment and taping of the heel , GAstrocnemius and physical modalities like foor roller and contrast bath. I seldom inject the heel with a successful resolution of symptoms within 4 week for any kind of pain and duration. I am happy that newer research is happening but without understanding the basic pathology and bio mechanical fault that is occuring and without attempting to correct it, its unwise to inject the heel.